As a young lion in the mid-1980s, drummer Winard Harper came of age in the midst of a jazz boom. Resurgent legends mentored budding players, providing them with invaluable experience and exposure. Record labels sought out young artists, and clubs rushed to book their bands. Harper first gained attention as a supple timekeeper in 1982 with tenor sax titans Dexter Gordon and Johnny Griffin. But it was his four-year run with vocalist Betty Carter that catapulted the Baltimore native into prominence. He made his Seattle debut with Carter, a savvy talent scout who ran her band like a boot camp for improvisers, and he’s returned many times as the leader of his own combo. He arrives in town on Tuesday for a two-night run at Jazz Alley looking at a jazz landscape transformed by technology and recession. After more than a decade leading a sextet constantly refreshed by a stream of top young talent, Harper is talking about downsizing. With sadness in his voice, he indicated that his longest-serving band member, Senegalese percussionist Alioune Faye, may not make the West Coast trip. Gene Argel is a native of the Pacific Northwest, and was a much loved fixture and “monster player” on the Seattle Jazz scene until his move to Hawaii in 1980. He dazzles his audiences with his jazz, blues, and Latin rhythms. Jay Thomas, Seattle’s ever-present mutil-instrumentalist post-bopper, especially remembers his funky earthy B3 inflections. Gene has played with a number of talented artists such as Gabe Balthazar, Joe Henderson, Henry Allen, Emil Richards, Branford Marsalis, Michael Brecker, Bill Evans and George Benson. Add to the mix some new friends with “funky drummer” Greg Williamson and the bassal support of re-bopper Chuck Kistler. Might there be a recording in process? Sushi master Hiroshi and his gang prepare a full menu of Japanese cuisine that is fresh, tasty, and full of flavor – all matched with some very special sake and beverages (try the plumb wine) Favored by local Japanese and music lovers, Hiroshi’s has been featuring live jazz on Friday nights for over three years – presented by the Pony Boy Records stable of artists. Come by for some fine food, and see who will be sitting in with the band – Fridays have become a ‘happening’ on Eastlake! IT’S HOT … COOL OFF THIS EVENING! There is a lot going on at Donn Bennett Drum Studio in Bellevue in the next week. Original CHICAGO drummer Danny Seraphine, jazz great Winard Harper and swingster Donny Osborne will all be here. Space is limited for these events, some are already sold out. If you want to check these out it’s best SIGN UP NOW!! Private lessons and master classes must be paid in advance. $2.00 service fee for phone transactions. For the Danny Seraphine Clinic payment can be made at the door, though advance reservations are recommended! Reply or call Kris at 425-747-6145 for info and to reserve a spot. All details are below. DANNY SERAPHINE just added 3 private lesson spots on Thursday 7/30 at 1:00, 2:00 and 3:00. All Friday lessons are sold out. There is still space available for his Thursday Clinic at 7:00 PM but it will definitely sell out. We are limited to 50 people. Arrive early if you want to guarantee a spot. DONNY OSBORNE will be back for a day of private lessons on Saturday August 1st. Donny was the protégé of Buddy Rich and Gene Krupa. He was the drummer in Mel Torme’s band for 25 years. He is one of the worlds greatest resources in the field of swing drumming. WINARD HARPER will teach a master class on Wednesday August 5th at 4:00PM. Winard is one of the hardest working drummers, composers, producers, and bandleaders in the jazz world today. Inspired by legends like Art Blakey, Max Roach and Billy Higgins, Winard has truly found his place amongst the greatest jazz drummers. For more about Winard CLICK HERE. Winard’s master class will be limited to 20 people. Winard and his band will be at Jazz Alley 8/4+5. Mention Donn Bennett Drum Studio for 2 for 1 admission on 8/4. Limited to 50 people, arrive early guarantee a spot. Anything sounds great when you add jazz! An entire disc of solo, improvised guitar music could easily run the risk of sounding like one continuous tune. Fortunately, Portand, Oregon-based guitarist John Stowell applies enough depth and open-minded searching to his nylon-string guitar to keep things interesting throughout Solitary Tales. The eleven-track disc was recorded live at the home of master guitar luthier Mike Doolin, who builds guitars for Stowell. Relying heavily on single-note lines, the guitarist seems to pull arching motifs out of thin air, eschewing clichés while maintaining a swinging essence. Stowell gives contemplative readings to Cole Porter’s “Everything I Love” and Bill Evans’ “Funny Man.” Steve Swallow’s “Outfits” contains some of the disc’s most inventive lines, with breathtaking leaps across the fret board. Ornette Coleman’s “Blues Connotation,” a disc highlight, jumps out as a bluesy surprise, as Stowell digs in with spirited phrasing. The up-close-and-personal setting and superb audio of Solitary Tales allow an extraordinary glimpse into Stowell’s uncompromising artistry. Learn more about Solitary Tales at Origin Records. from Earshot Jazz: Winner of the 2008 Earshot Golden Ear for 2008 Recording of the Year, percussionist extraordinaire Byron Vannoy here performs with a special trio featuring pianist Jon Solo & bassist Geoff Harper. Vannoy is a nuanced player, his strokes crisp and his ideas thoughtful. He has also proven himself a composer of considerable gifts, as those familiar with his Meridian ensemble well know. Don’t miss this opportunity to see a true-rising star of the Seattle creative arts scene, performing in an intimate group and performance space. The Byron Vannoy Trio will perform at Egan’s Ballard Jam House on July 28 at 9PM. PORT TOWNSEND — Young faces and new names dominated Jazz Port Townsend this year, emerging talent that pressed audiences against the future of jazz. But as the three-day festival neared its peak Saturday afternoon, the audience was asked to look to the past. The festival’s artistic director John Clayton took the lead, recalling for those who packed McCurdy Pavilion in Fort Worden State Park, the first time, at age 16, that he ever listened to a recording of pianist Oscar Peterson. Like most, he was astounded and he never looked at jazz music the same way again. He remembered “every note,” Clayton said. And with that, Clayton introduced to the stage the pianist Peterson named as his protégé, Benny Green, who had agreed, for the first time since Peterson’s death in 2007, to perform a set of Peterson’s music as a tribute to his former mentor. Clayton himself was mentored by Peterson’s longtime bass player, Ray Brown, who also made Green part of his own trio in the early 1990s. Before Green sat down at the piano, Clayton made a phone call to Peterson’s widow, Kelly Peterson, from the stage so she could hear the audience applaud. Green, 46, who performed with Seattle bassist Doug Miller and drummer Alvester Garnett, is one of few — if not the only pianist — who not only understands Peterson but can play like him. Capturing Peterson’s sound means taking command of the entire keyboard in a way few have done, doubling up his lines of improvisation with his right and left hand, filling songs with stout chords and bluesy turns, swallowing whale gulps of notes at a time but pronouncing each one meaningfully. Several hours before she took the big stage at McCurdy Pavilion for her festival debut, she explained some of the singers she liked the most did not have the greatest technical ability, but rather a certain quality to their voice, a pleasing sound, an emotional gravity. To a large degree, she could have been talking about herself. New to many audiences, Parlato performed Friday night at Jazz Port Townsend with the Gerald Clayton Trio, challenging notions of what defines a great jazz singer. Her voice has a breathless quality to it. She emphasizes phrasing and subtle changes in pitch rather than melodic acrobatics. She sings much the way she talks. She possesses a soft but striking voice that sounds wistful and sleepy, the way someone sounds perhaps if they’ve recently been crying. As festival director John Clayton put it, she puts the microphone close to her lips and “whispers” the song into your ear. Cal Anderson Park, 1635 11th Ave (btn E. Denny and E. Pine). Bernie Jacobs is a versatile musician who plays flute, saxes and sings in a wide range of settings. We recorded the Bernie Jacobs Quartet in the July Art of Jazz concert at The Seattle Art Museum. Highlights from this concert including standards, jazz and blues will air on Jazz Northwest, Sunday July 26 at 1 pm on 88-5, KPLU and www.kplu.org. 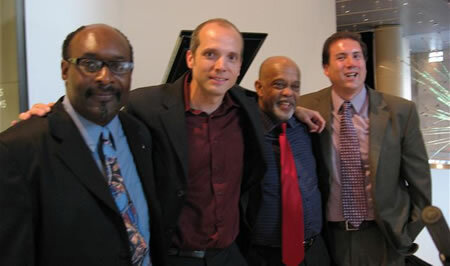 The group includes Bernie Jacobs, Eric Verlinde, piano, Chuck Kistler, bass and and André Thomas on drums. The Art of Jazz series at the Seattle Art Museum is produced by Earshot Jazz and the Museum and is presented free of charge on the second Thursday of each month. Jazz Northwest is recorded and produced by Jim Wilke exclusively for KPLU. The program is also available as a podcast after the airdate. 8 p.m. Saturday, Triple Door, 216 Union St., Seattle; $20 (206-838-4333 or www.tripledoor.com). Some jazz singers forge a distinctive identity by finding overlooked tunes, while others put an indelible stamp on familiar standards through the force of their personality. And then there are the rarefied few who weave a new repertoire out of whole cloth, outfitting their book with material transformed by a bracing new concept. Jacqui Naylor, a self-possessed San Francisco vocalist with a pleasingly smoky sound, belongs to the latter category. She started her career as a jazz chanteuse captivated by the American Songbook, but in recent years she’s distinguished herself with a surprisingly effective strategy she calls “acoustic smashing.” Through an ingenious process of musical alchemy, she melds seemingly disparate songs, combining beloved pre-rock standards with contemporary songs from the rock era. Following up on our recent stories regarding the programming changes at KBCS a number of people have commented that they listen to a majority of their music online now. You might have noticed on the right side of Seattle Jazz Scene an ad for Origin Records Online Radio through Live365.com. If you have never tried it out, simply click on the PLAY button and it will launch the radio player (you may have to listen to a few ads at the beginning). From 11am – 1pm every day Origin Records has added the Northwest Jazz Show highlighting some of the artists on the label from their hometown. For the full list of proposed changes by KBCS management, click here. Looking at this list it is evident that a large chunk of jazz will be taken off the Seattle airwaves. Drive Time Jazz especially will greatly impact the Seattle Jazz Community. We at Seattle Jazz Scene have talked to a number of KBCS DJs over the years and they have made it their mission to consciously play new music, music by active jazz artists (something you can’t always hear on KPLU), and give prominent attention to Seattle jazz musicians when they have new CDs out. With the 7-9am Drive Time Jazz spot filled with public affairs programming, KBCS is going head-to-head with public affairs programming on KPLU, KUOW, AM1090 and others. With John Gilbreath being tapped to host a 9 – Noon spot Monday – Friday, this poses even more questions for the Seattle jazz community. His new show is listed as playing, “jazz, world, and Americana,” which means jazz have a smaller presence than it currently does. And with Gilbreath on the air 15 hours a week (and at least another hour a day in commuting bringing his total commitment to approximately 20 hours), how will impact his job as Executive Director of Earshot Jazz? From what we have heard and what has been written by KBCS management, the change in programming has been brought on by declining listenership. Looking at traditional Seattle media metrics this claim can be validated. But … one should point out that KBCS’ listeners are far from “traditional”. KBCS’ programming is eclectic and therefore their listeners are eclectic. Are jazz fans inclined to listen to afternoon world and folk music? Probably not. But that is the charm of KBCS. It is a station that servers many musical communities throughout the Northwest.